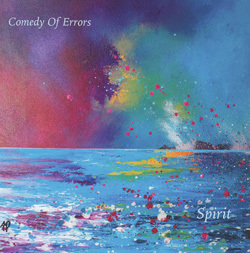 As you might expect from a band whose name comes from one of The Bard’s plays, Scotland’s Comedy Of Errors namecheck Shakespeare amongst other literal and musical influences on their latest album ‘Spirit’. Originally formed back in 1984, the band plied their wares for five or so years against a rising tide of apathy before calling it a day; reforming in 2011, almost twenty years later, they’ve issued three albums, with ‘Spirit’ following on from 2013’s ‘Fanfare And Fantasy’ and ‘Disobey’ which appeared two years prior to that. In essence, what you have this time round is a one-track album, as ‘Spirit’ is dominated by its title cut. A roundly introspective, but ultimately heartening, forty-five minute tour-de-force, the song ‘Spirit’ is split into ten tracks, although the sleeve notes make it clear that “these divisions and titles are arbitrary; the ‘song’ is in fact one long single unbroken piece of music best listened to in its entirety from beginning to end.” But that doesn’t mean that Comedy Of Errors are a one-trick pony, as ‘Spirit’ cleverly crosses boundaries and genres, mixing a wide range of influences and invoking the essence of the early Eighties progressive rock ‘revival’ of which Comedy Of Errors were originally a part. It’s easy listening in a challenging kind of way, and the exceptional talents of the musicians – vocalist Joe Cairney, John Fitzgerald (bass), Jim Johnston (keyboards and songwriter), Bruce Levick (drums) and guitarists Sam McCulloch and Mark Spalding – shine through as the “arbitrary” tracks flow past like a fluid contour on the classiest car on the block. A point of reference could be early Marillion, back when they too had a Scot standing front and centre, or perhaps the grand works of Trans-Siberian Orchestra. Taking ‘Spirit’ as one lengthy song makes it hard to highlight any track or tracks in particular as it’s easiest just to sit back and let the music drift by, although I’ll admit (perhaps unsurprisingly) to being a sucker for unexpected heavy workout midway through ‘I Call And Cry To Thee’. After that work-out comes a six-minute instrumental epilogue ‘This Is How It Has To Be’, and as a bonus track a single version of ‘Spirit’ round things off.